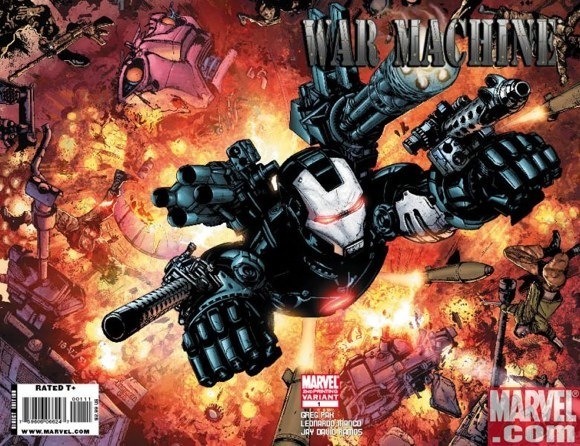 “War Machine” #12, the last issue of the series from writer Greg Pak, hits comic book stores on December 9. Comic Book Resources has posted a colored, lettered preview of the first six pages. UPDATE: Newsarama has the preview as well. “War Machine” #10, written by Greg Pak, hits comic book stores today, and Comic Book Resources has a lettered preview of the first six pages. Check it out — and ask your local comic shop to hold a copy for you today! It’s a timeless tale twisted in enough ways to be novel and it’s also packing the secret weapon of the one and only John Romita Jr. on art, and his pairing with Pak could not be more perfect as he draws just as grand as his writing counterpart tends to plot. And all of these characters, be they male or female, are strong, intelligent, and very, very good at their jobs. When the women are in danger, theyâ€™re saved due to the efforts of a mixed-gender team â€“ as are the men. And if some non-white characters have shady criminal histories, theyâ€™re balanced out by those with impeccable records. These characters defy stereotypes and pigeonholing, and though their cultural backgrounds have obviously had an impact on their lives, as we see specifically in flashbacks to Rhodeyâ€™s childhood, their race isnâ€™t their sole defining feature. Given the number of unforeseen obstacles that Rhodey has had to deal with in the last few issues, it might seem as if very little has gone according to any type of plan. But looks can also deceive, according to Pak. If you remember the “West Coast Avengers” series from years gone by, then Greg Pak has a special treat for you. Following the activities of the past few issues, James Rhodes has to answer to former teammates about the deeds he has meted out in the name of justice. Pak does a great job of pacing this tale and highlighting the personalities of the Wackos (as Ben Grimm used to call them) as he uses Clint “I Can’t Believe He’s Not Hawkeye” Barton to crack the shell of what is really going on.